Although the Jan 17 battle for the Kuala Terengganu parliamentary seat is a three-cornered fight, it will boil down to a straight contest between Umno and the opposition Pas. And Umno is coming across as the underdog. 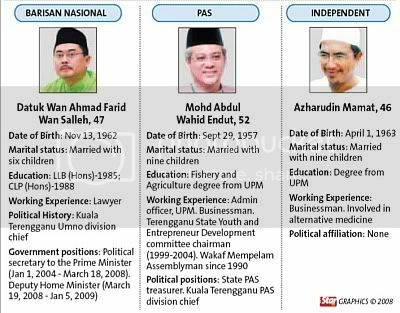 When nominations closed yesterday, three candidates made the cut: Umno’s Datuk Wan Ahmad Farid Salleh, Pas’s Abdul Wahid Endut and independent Azharuddin Mamat. The last is a relative non-entity who could draw 600 or so votes — but these could decide who wins the seat. In last year’s March 8 general election, an independent won more votes than the winning majority of Umno’s Razali Ismail, whose death last month led to the coming by-election. Observers could be forgiven for thinking this is a general election. Umno chieftains, led by Deputy Prime Minister Datuk Seri Najib Razak, have descended on Terengganu’s sleepy capital on the shores of the South China Sea. The by-election comes at a crucial time for Umno, as Prime Minister Datuk Seri Abdullah Ahmad Badawi, 68, prepares to hand over the reins in March to Najib, 55. Abdullah’s hand was forced after last year’s general election, in which the BN lost its two-thirds parliamentary majority and five states — its worst outing since independence. Umno desperately needs to win Kuala Terengganu, not just to restore its credibility after its disastrous general election result but also to affirm that it alone is the true political champion of the ethnic Malays who make up 64 per cent of Malaysia’s population. Malays make up almost 90 per cent of the Kuala Terengganu electorate. To a lesser extent, the by-election is viewed by many in the opposition as a referendum on Najib’s ascension, partly because he is leading the fight there. The deputy premier has downplayed the symbolism, but the opposition has made it a main campaign point. One reason for this is the opposition is confident that it will win. Political analysts aren’t so sure, though, saying it will be a close race. But much is being made of Umno’s choice of candidate. The party’s Wan Farid, a senator and deputy home minister, used to be Abdullah’s political secretary and is a close friend of Khairy Jamaluddin, Abdullah’s controversial son-in-law. Although born in Terengganu, Wan Farid generally lives and works in Kuala Lumpur, unlike his Pas rival in the by-election, who’s about as local as it gets. The Pas candidate, Abdul Wahid, is a five-time state assemblyman from Kuala Terengganu and a very popular figure in the area. Dr Mahathir did not name the “user”, but it is clear to everyone that he was referring to either Abdullah or Khairy — both of whom he dislikes. 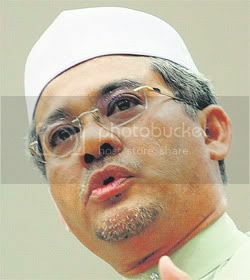 Umno officials privately admit that Dr Mahathir’s remarks are damaging and could hurt Wan Farid’s by-election chances. There are 80,229 voters in the constituency. An analysis of the March 8 elections won by the late Datuk Razali Ismail of BN showed that 53 per cent of the Malay vote went to Pas while 64 per cent of the Chinese vote went to BN. Chinese voters make up nearly 11 per cent of the electorate. The voter turnout on March 8 was 87 per cent.